If you’re new to the world of comics, you may know the name Robert Kirkman from the AMC’s hit TV show “Walking Dead.” But did you know he has an amazing ongoing book over at Image? Well if you did, good for you; if not, welcome to a review of Invincible #85. 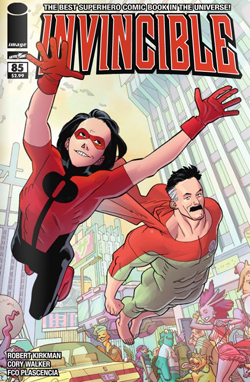 Would #85 make you a fan of Invincible after you’re done reading it? Find out in this Advanced Review! First off, let me just say WOW and great job to everyone who works on Invincible to hit such a BIG number as 85. That is very impressive in a world full of #1’s and reboots. Invincible #85 shows me exactly everything I enjoy about this over-the-top space opera, starting from the uncomfortable opening scene with Invincible’s parents. Just think about something you never want to see your parents doing, and you get that in this issue; yet Kirkman knows how to make fun of it. In this issue we also get to see what happened to Oliver’s (Invincible’s little brother) hand – I don’t know why, but that scene made me think a lot of Star Wars Episode V, The Empire Strikes Back. At the same time, we get to see something I’ve always been a fan of in the Invincible universe: all the weird kinds of aliens. In this issue we are surrounded by them – the only humans are Oliver and his parents. I bring this up to talk about how talented Cory Walker is. Sure, anyone who works in the comic industry can easily illustrate a book full of humans, but imagine a world full of unique aliens, just like the cantina on Mos Eisley. That’s what you get in this issue. There are some drop-dead gorgeous, stunning pages in this book, as Oliver and his father (Omni-Man) are flying around talking about some crucial information that will change the status quo. At the same time, we find that someone is trying to take down the Viltrumite; if you’re not sure what the Viltrumite are, just think of the Kryptonians in Superman’s world. The book left me wanting to know what is going to happen in this story arc, and for someone who reads over 20 comics in a week, that’s something impressive. This shows me why Invincible is still one of the best comics out there. Now would this issue be a perfect jumping on point for new readers? I say, go for it! Jump into the world of Invincible, and see what it has to offer you. Remember, Marvel and DC are not the only ones with amazing super-hero books. Invincible is one of the best ongoing super-hero comics on the market, and it would be a shame if you did not read it. What better way to start then with issue 85? Look for it at your comic book shop on November 23rd, 2011, and you will be thanking yourself at Thanksgiving for picking up this book.